The typical materials that we print with and that you can have something printed in are listed below. Would you like to have something 3D printed or need something produced quickly? Our 3D printing workshop is available for your needs. We provide custom 3D printing on eight FDM 3D printers. We are able to print with multiple technologies and a variety of materials. Keep in mind that things that are 3D printed will have layers and may also have supports and other structural elements. You can learn more about how we post process our prints in some of the workshops we offer. 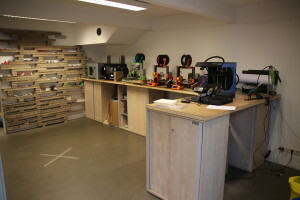 Become a member of MakersLab and you can come anytime and print anything you want. The so-called rent of the 3D printer costs 110Kč/hour and includes the material and some support from our staff. Send us an STL file of the object and we will print it. Below is an approximate breakdown of the costs associated with printing. These costs vary from order to order, but it comes out to about 200Kč per hour of printing.